Our application for the Pepsi Refresh Project was accepted! Because we finished in the top 100 in December, we were automatically rolled over into the January voting. We are in the running for the $25K grant. This money would be used to build new enclosures, pay our vet bill, purchase medical supplies and purchase a new vehicle, which will help us provide even better care for our residents. Voting is open until 11:59 p.m. on January 31st. At the bottom left corner, you'll see "Welcome!" Below that, you will be asked to sign in or "Join Refresh Everything". If you have not yet created an account, click "Join Refresh Everything." This will pop up a small window for you to enter your name, email address, password of your choice, and birthdate. You will need to then enter the authentication text. You may opt in to receive their emails, but it's not required. Click "Done," and you may begin voting! If you already have an account, click "Sign In" and enter your email, password and verification text in order to begin voting. You may also vote from your mobile phone by texting 104283 to 73774 (standard texting rates apply). So, you've logged in. Now what? Click the big "Vote for this idea" button near the upper right corner! You are given 10 votes per day, but may only vote once per day per idea. After you've voted, please help spread the word! If you use Facebook, Twitter, or other social networking sites, please click on the "Promote this Idea" button for the site you use (located on the right side of the page). This will create a shorter link and open a pop-up window for you to log into the other site. The title and link will be there, waiting for you to approve it. If you're on Facebook, you can go to this link to install an application that will allow others to vote for us from your Facebook page. If you have a blog or a website, you may also grab the widget (located on the right side of the page) and add it to your site. Please remember to vote every day and please ask your friends and family to vote for us, too. Every click helps! And thank you! Our thanks to Patty Barnes for submitting this grant, and to everyone who votes! Photo of Yeddy and Banjo by Sharon Greene. We have recently taken in an animal that was hit by a car who required surgery to repair the damage to his leg. 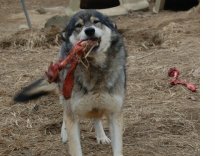 He was living in an area where wolfdogs are illegal. His story is lengthy and complicated, and can be read in much more detail on our website. His surgery was not inexpensive, mostly due to this poor animal going for weeks without the treatment he needed to repair his broken leg. Nancy has set up a Chip In account to collect funds for his bills, which can be found on our website. You may also donate via the PayPal link on our Donations page, or by sending a check either to us our to our vet, Animals R Us, 725 Crest Rd. Flat Rock, NC 28731 (please reference FMF and the Savannah Rescue). We are grateful for any and all assistance. Thank you. Our Grants Coordinator, Patty Barnes, has been submitting grant applications on our behalf. Her hard work has finally started to pay off! Full Moon Farm has received its first grant ever, awarded from the Greg Biffle Foundation! They received over 400 applications, and we were one of the lucky ones chosen. They will also be donating autographed items for us to use in our Silent Auction later this year. Our thanks to Greg and Nicole Biffle and Jenni Leibee. We are grateful that you selected Full Moon Farm as one of your 2011 grant recipients. If you have any suggestions for grants that we might be eligible for, please contact Nancy at nancy@fullmoonfarm.org. This month, it's Cody and Meisha! 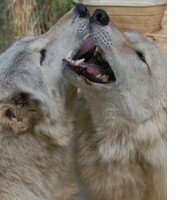 Cody and Meisha are two of the South Carolina animals. They were initially paired up down there, and are completely devoted to each other. Cody is a big ol' goofball, who is very happy for attention. On occasion, he likes to think that he's a lapdog, which is very cute. Unless it's your lap, and you're not properly balanced. He means well, though. Meisha is a bit on the shy side. She has started to warm up to some of our volunteers. We thought she was expecting when she arrived, but it ended up being a uterine tumor. The tumor was removed, and after she recovered, she was moved into a pen with Cody. She has been doing very well post-surgery. We love watching these two play. They are very adorable, and a lot of fun to watch. They're even more fun when they play with you! Photo of Cody nuzzling Meisha by Michele Frankl. Say hello to Daegan! He comes to us from a shelter in Chesapeake, VA. 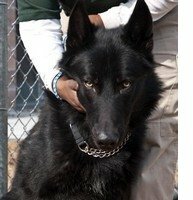 He was picked up as a stray in an area where wolfdogs had recently become illegal. No one came forward to claim him. The shelter would only release him to a sanctuary. He's still a bit shy, but is very handsome. We're hoping that he settles in and warms up to us soon. His name means "black haired" in Gaelic, and he was named by a supporter who is now his sponsor. Nancy would like to evaluate him and see about placing him, as he had been a pet. Sadly, we had to send sweet Misty over the Rainbow Bridge. She had broken out yet again with her autoimmune disease. (The pattern was, she would get well for about six weeks, then break out again. It would then take weeks or months to make her well again, only to have her break out again.) The drugs used to treat her condition, in combination with her suppressed immune system, took a toll on her liver. With her last breakout, Nancy learned Misty's immune system was gone, and with it, her chances of a recovery. The kindest thing to do at that point was to euthanize her. She was laid to rest in our cemetery. We all miss her terribly. Photo of Daegan by Michele Frankl. Photo of Misty by Ryan Talbot. Our thanks again to Blaze-N-Skyy for letting us have an information booth at their 1 year anniversary celebration. Thanks also to Surf Dog Ricochet for donating one month's supply of Natural Balance dog food. Williams Meat Processing in Marion has been donating deer meat. The woofers love it (as you can see by the photo of Harley), and we are grateful for the help in keeping our feed bill low. Thanks again to The Carolina Asheville for allowing us to table during the premier of The Chronicles of Narnia: The Dawn Treader. Thanks to the Grove Arcade for letting us participate in their gift wrapping program, and thanks to all who came out to have their presents wrapped. Thanks to Andrew Wagner of Wagner Tree Experts for removing a dead tree from Mani and Marion's pen before it became a hazard. Nancy has done a couple of radio shows. Thanks to Illuminations of Light and Straight Talk Live for having her on. Thanks again to our awesome vet, Dr. Beverly, from Animals R Us in Flat Rock, who came out to do our rabies roundup. Vaccinating 50+ animals isn't easy, but she makes it seem like it is. Thanks to Case Farms Chicken in Morganton for giving us a fantastic deal on chicken for the woofers. Photo of Harley with deer leg by Sharon Greene. Help us win! All you have to do is click to help rescued animals, and then vote in The Animal Rescue Site $100,000 Shelter+ Challenge. Both of these actions are absolutely free! You can vote once a day, every day, from January 10th through March 20th, 2011. Every time you vote, or tell a friend to vote, you are making a huge difference for us. It's easy to do! Go to The Animal Rescue Site and click on "Click here to give-- it's FREE" (the big purple button in the upper right). On the next screen, click on the "Vote Now" button at the top of the page (it has the little hearts on it). On the next page, type in "Full Moon Farm" for the shelter name, "NC" for the state, and click "Search." On the next screen, click the "vote" button, and you'll be taken to a page with a picture of an animal. Once you type in what it is, click "submit," and you're done! We are funded by your generosity, and your tax deductible donation helps keep our animals fed and healthy! You can donate here to help. We are thankful for any and all assistance. Our 2011 events schedule can be viewed here. Please keep checking it, as events will be added as the year goes along. They will also be added to the calendar on our website.